We know the last thing you want to be doing in your free time is home maintenance. We want to help. Your home maintenance expert will conduct a comprehensive maintenance inspection covering every room in your house. During this visit, we take care of all the messy chores that are a necessary part of maintaining your home, including cleaning drains, changing furnace filters, caulking counters, showers and tubs, cleaning refrigerator coils and dryer vents. We also take care of the small projects on your honey-do list like hanging pictures or changing light bulbs so you can enjoy your valuable free time. 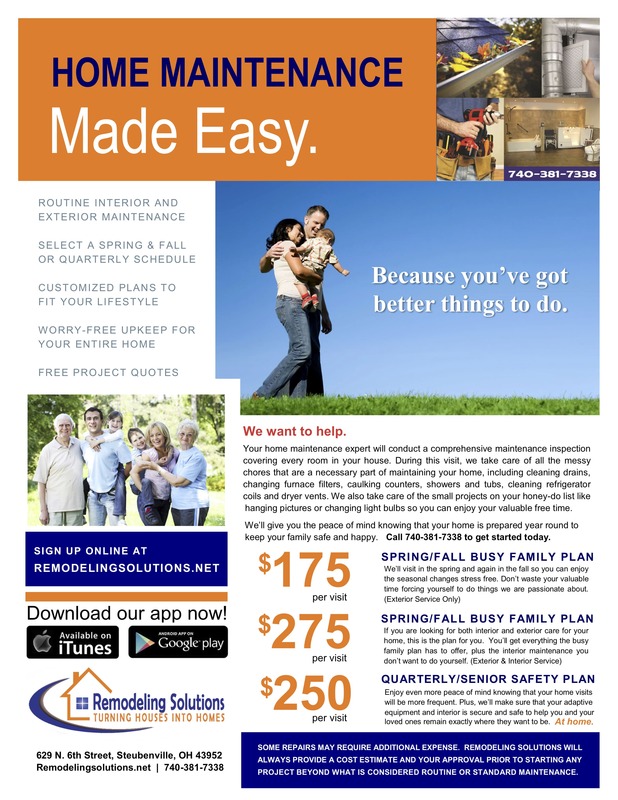 We’ll give you the .peace of mind knowing that your home is prepared year round We have three affordable plans to choose from so there’s bound to be one that is perfect for your family and your aging parents. • Scrub mildewed areas of decks and treat for water stains, mildew, and fungus. • Inspect roof for leaks. • Check for damaged, loose or missing shingles. • Look at vents and louvers for birds, nests, squirrels, and insects. • Check flashing around roof stacks, vents, and skylights for leaks. • Inspect gutters and downspouts for leaks, misalignment, or damage. • Clean exterior windows up to 10 windows. • Check exterior walls for deteriorating bricks and mortar. • Look at siding for damage or rot. • Check painted surfaces for flaking. • Inspect landscaping and trim shrubbery around walls. • Inspect plumbing shut-off valves for proper operation. • Remove debris from around cooling units and clean. • Check roof for leaks, damaged, loose, or missing shingles. • Inspect vents and louvers for birds, nests, squirrels, and insects. • Clean gutters and downspouts and check for leaks, misalignment, or damage. •Look at exterior walls for deteriorating bricks and mortar. • Check siding for damage or rot. • Inspect countertops for separations at sinks and backsplash. Caulk and seal where required. • Inspect tiled areas for loose or missing grout or caulking. Repair if necessary. • Inspect shower doors/tub enclosures for proper fit. Adjust if necessary. Inspect caulking and repair if necessary. • Check weather stripping and caulking around windows and doors. • Check window and door screens. Adjust or replace if necessary. • Inspect sectional garage doors. Adjust the travel and tension. • Flush out hot water to remove accumulated sediment. Enjoy more peace of mind knowing that your home visits will be more frequent. Plus, we’ll make sure that your adaptive equipment is secure and safe to help you remain exactly where they want to be. At home. This is the perfect plan for older homes and older folks. You’ll get four visits a year covering interior and exterior areas of your home with the completion of everything you’d expect from the Busy Family Plan and the added comfort of knowing that we’ll inspect and secure other things that you depend on. • Check handrails for secure if needed. • Inspect ramps and stairs for loose boards or uneven surfaces. This type of thing is awesome as well as cool. In the event that you are looking for this kind of help, look no further. As well as keeping your home looking good on the outside as well as the inside, we offer full remodeling for kitchens as well as bathrooms indoors. In addition we offer outdoor stuff as well. In the event of Home Maintenance, sometimes people are just too busy to be able to go through and check things. An example of this are things such as vents and walls. In addition these could be things that include heaters as well as air conditioners. With this in mind, Remodeling Solutions has offerings that give people a sense of ease. Together with a strong team of people, clients get the chance to decide what type of plan they truly need. An example of this is our Seniors at Home Plan. In the event that you are in the need to have people come in to take care of things that Seniors at Home really shouldn’t deal with, contact us today! Most of our programs are great for any family. Therefore you are getting the best from the best. In addition to these service Remodeling Solutions offers top notch answers for any of your home needs. With this in mind you can start your project right now with us! Whenever is comes to what busy really means, it depends on the person. Regardless of the family, rather than having to do yearly check up yourself, we are here for you. Our team will visit in the spring as well as the fall to check up on things. Therefore we off a Busy Family Plan as well as a Busy Family Plan. In the event you chose the Busy Family Plan you will be getting the outside package. As a result you are going to have the team inspect things such as shingles as well as vents in the spring time. In addition the as the windows as well as the flashing will get a good look as. Also with the Busy Family Plan you’re able have trees trimmed as well as debris near the house removed. Therefore there will less chance of bugs that might go inside the home. The Busy Family Plan is great for people that want to keep a good impression. Whenever is comes to our Business Family Plus Plan you are able get all the exterior services as well as the interior services. Therefore in the event that you don’t want to worry about the inside as well as the outside you can get the Busy Family Plus Plan. As a result you will be getting extra perks such as checking the shower doors in the bathroom as well as the countertops in the kitchen. In addition indoor plumbing as well as the hot water take will get an inspect. Whichever plan you decide some have more pluses to it than others. With this in mind, you’re given more choices on how to keep your home in tip top shape. Senior Safety is very important to us. Therefore we offer a Senior Safety plan for Seniors at Home. With things inspected such as ramps as well as rails, you can rest easy that your loved one will not be falling whenever no one is around. Senior Safety is key when you are dealing with Seniors at Home. Together with our other programs you have the ability to have all Home Maintenance issues taken care of for your loved ones. Whenever it comes to having Seniors at Home, it can be hard to leave them without spending time worrying about if things are going to get taken care of. As a result people can put things aside to focus on other things. Instead, let Remodeling Solutions take care of the harder things. With so many different Home Maintenance plans you no longer need to stress out over making sure your loved one is good to go whenever it comes to their home. Contact us today and we will work with you. Additionally you will be getting plans that are simple as well as easy. Therefore you don’t have to worry about it yourself. With this in mind you will rest easy about things. However you decide you get a great price. In spite of the other guys you won’t get the best service as well as the best tools. Be that as it may, you can get plans that will do the job right the first time.Then again most people say that but we mean it as well as show it. Above all we want to give our customers the best Home Maintenance Plan available. In reality you’re getting a great deal from a great company.After all Remodeling Solutions strives to be your go to company.